Figure 2. First photo of Earth from the Moon, sent back by Lunar Obiter 1 on Aug. 23, 1966. Figure 3. Hailed as 'the picture of the century' when it first appeared in 1966, this oblique view of the lunar crater Copernicus was, for most people, their first close-up look at the Moon. It was taken by the Lunar Orbiter 2. 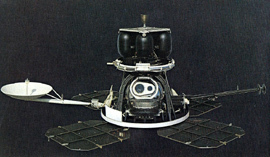 Lunar Orbiter was a series of five, highly maneuverable, Moon-orbiting NASA spacecraft, launched in 1966–67 (see Figure 1). The Lunar Orbiters' primary mission was to obtain topographic data in the lunar equatorial region between 43° E and 56° W to help in the selection of suitable landing sites for the unmanned Surveyor and manned Apollo missions. 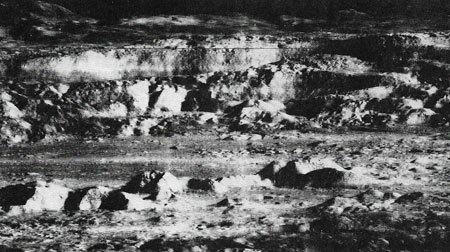 With this objective achieved by Lunar Orbiter 3, the remaining two flights were able to carry out further photography of lunar surface features for purely scientific purposes. Altogether, 99% of the Moon was photographed with a resolution of 60 meters or better. The first three missions were dedicated to imaging 20 potential lunar landing sites that had been chosen from Earth-based observations. These were flown at low-altitude, low-inclination orbits. The fourth and fifth missions were flown in high-altitude polar orbits. Lunar Orbiter 4 photographed the entire nearside and 95% of the farside; Lunar Orbiter 5 completed the farside coverage and acquired medium (20 meters) and high (2 meters) resolution images of 36 pre-selected areas. The Lunar Orbiters also collected data on radiation and micrometeoroids in the circumlunar region. 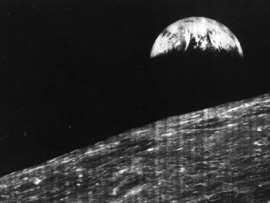 Lunar Orbiter 1 was the first spacecraft to send back a picture of Earth from lunar orbit (see Figure 2). Lunar Orbiter 2 returned a dramatic photo of the crater Copernicus which the press described as the "picture of the century" (see Figure 3).